Good news! Stanley UK has reissued the 750 socket chisel. What’s the big deal you say? Ask any woodworking tool collector what the most sought-after bench chisels are and chances are many will say the Stanley 750 series. 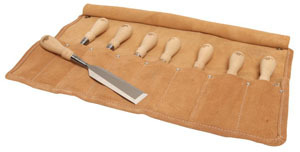 The popularity of these chisels stems from several reasons. They are Stanley products after all. Old Stanley tools have always been collectable, generally at reasonable prices. Good publicity in the trade journals and blogosphere has also added to the mystique of the 750s lately. Lastly they are just good looking and good quality tools. As a result, Stanley’s 750 socket chisels were the inspiration for Lie-Nielsen’s excellent line of bevel edge chisels. Currently the only drawback to used 750s is the price. The high prices are a result of increased demand from all the good press these chisels get. On the used market an individual Stanley 750 in useable shape can run $50 plus. What’s left in the affordable range are beat-up, rusted tools with missing handles. I always find the sockets mushroomed from repeated hammer blows when the handles are missing. Given these facts, the Lie-Nielsen version looks like a deal starting at $55. But as well made as the Lie-Nielsen chisels are, they are outside the budget of many woodworkers. So, when I found out the new Stanley 750s (sold under the Sweetheart label) were going to sell at a starting price of $30, I wanted to give them a go. Let me tell you, I was pretty happy when I received 3 brand new Stanley 750s in the mail, sized 1/8″, 1/4″ & 3/4″. These are the widths I use most during the workday for joinery and general paring jobs. In my next two entries of this three part post, I’ll tell you how I prepared the new chisels for use, and what I thought of them as I used them.